'Tis the season for online shopping. Well, not quite yet, but it’ll be here before you know it. In fact, according to CPC Strategy’s survey results, 35.5 percent of shoppers surveyed planned on starting their holiday gift shopping before Thanksgiving. That’s why you need to start putting together your holiday marketing plan now. As soon as autumn hits, shoppers are bombarded with stunning holiday advertising and jaw-dropping deals from companies that will be fighting for their attention during that busy season. But how will your company break through the noise and get consumers to make holiday memories with your business? Let’s get festive, then, and think about seven things you might consider when putting together your holiday marketing plan. There’s no better way to boost your holiday sales than to send deals straight into shoppers’ inboxes. Email still converts the best for online holiday shopping. According to Shopify, a staggering 8.8 billion data points were collected on Black Friday in 2017, in the form of email sign-ups and other lead-generation tactics. Since holiday shopping starts as early as November, you’ll want to craft your email marketing messages now and schedule them to be sent automatically. Not all customers are created equal, either, so use your customer data to segment your email marketing. For example, if a large proportion of your customer base are busy moms, don't send a broad, unpersonalized email; instead, send them one with products and tips to ease their stress during the holiday season. Personalized emails will make you stand out from the rest. Have a countdown timer for sales. Ever heard of FOMO (a.k.a. "the fear of missing out")? Creating a sense of urgency is one of the most effective strategies to make consumers feel that something valuable is being offered that they don’t want to miss out on. An eye-catching way to create urgency is to display countdown timers for sales. 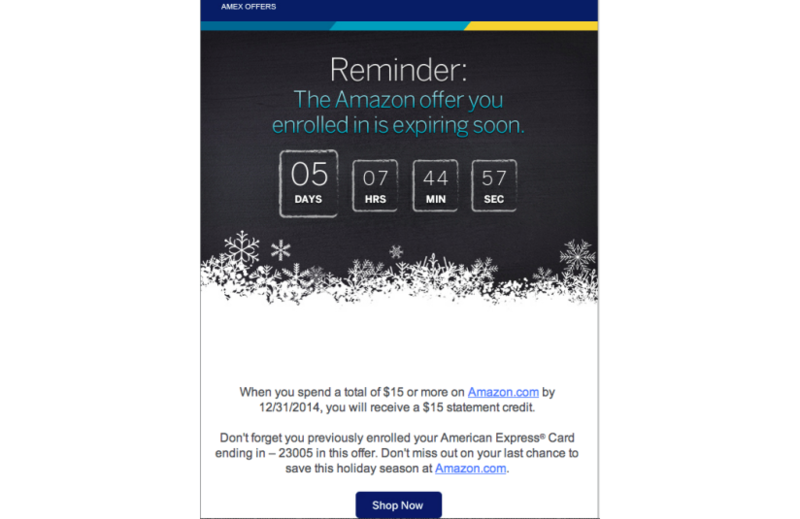 For example, American Express displayed a countdown to the expiration of a special Amazon deal it offered its customers. You can easily add a countdown timer to your website for free using the T(-) Countdown plug-in for WordPress. Seeing a visual symbol, like a countdown timer ticking down the minutes, pushes consumers into action by raising the urgency level to high. Think about a "free" shipping strategy. Since consumers today are spoiled with Amazon Prime and same-day shipping, your business needs to offer awesome shipping deals this holiday season in order to compete. By reducing shipping costs for your customers, you’ll increase your chances of shoppers buying from you instead of from a big-box retailer. Want to offer free shipping but afraid of losing money? Set a minimum order amount -- for instance, customers must spend $50 to unlock free shipping -- or offer free shipping on select items, like your lightest items only. That way, you can offer customers free shipping without cutting into your profits. And remember to account for realistic shipping times and cutoffs throughout the season to ensure your customers receive their orders in time for the holidays. Content marketing is one of the best ways to drive traffic to your site, so add a little holiday cheer to your blog. Crafting holiday-themed content will get your business in front of a ton of consumers searching Google for holiday-based and buyer keywords. Make sure your content is valuable to the reader; if it helps solve their holiday problems, they’ll be more likely to share it. Lululemon does this well by creating holiday-themed lifestyle blog posts as well as posts about gift ideas for your loved ones. Start thinking about content ideas now so you won’t have to scramble at the last minute. Brainstorm some fun holiday topics and plan out your content using a content calendar. CoSchedule offers free content calendar templates that will help keep you organized during this hectic season. Devise a social media strategy. Getting festive on social media is a great way to capture the attention of shoppers on the lookout for deals, and to inspire a cheerful connection between consumers and your brand. A great tip to avoid becoming overwhelmed come November is to create all your social media graphics ahead of time. Don’t have a graphic designer? Don’t worry. Canva is a free tool where you can easily create all the stunning graphics you need to advertise your products with high gross margins and your free shipping holiday deal. You can also find fun images to use to wish your customers a happy holiday. Schedule all your posts with a tool like Buffer, to make your life even easier. And consider enabling a Facebook retargeting pixel, too. It’s a highly effective strategy to recapture those shoppers who left your site without buying. When users abandon your site in search of other deals across the web, a retargeting ad will "follow" them and display specific ads to encourage them to return to you. Create a holiday gift guide. Finding the perfect gift can be stressful, so make things easy for your customers by creating a holiday gift guide. With a gift guide, you’ll be able to showcase your best products and increase organic traffic by taking advantage of the shoppers searching "gift guides" on Google. 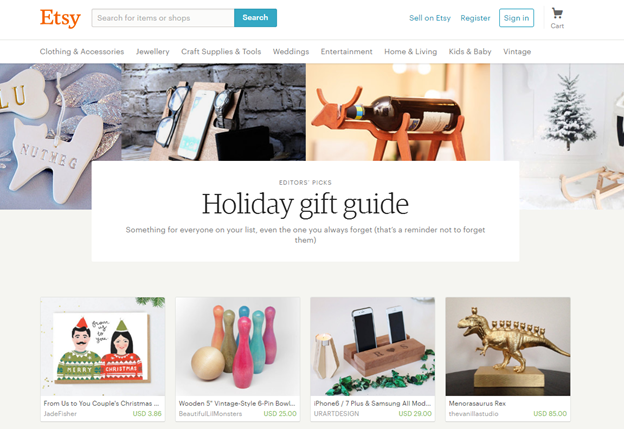 Etsy curates stunning products for a gift guide its shoppers can easily browse. You don’t have to be a computer wiz to add a gift guide to your site, a clever hack to create your own is to use a free menu plugin for WordPress like Restaurant Menu by MotoPress. Instead of food photos, add photos of your products and product descriptions; your customers will now have a convenient way to see what items you recommend. You can also reach out to other websites or publications that will feature your products in their gift guide so that even more people will discover you. Don’t wait any longer: The holiday season is right around the corner. With these simple strategies, your holiday marketing will turn jaded shoppers into jolly customers, and the boost in your revenue will be the best gift you’ve ever received.